This article is about the Polícia do Exército of Brazil. For the similar named Polícia do Exército of Portugal, see Army Police (Portugal). 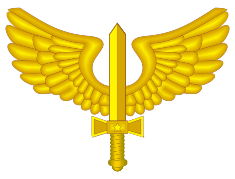 The Army Police (Portuguese: Polícia do Exército, PE) are the Military Police of the Brazilian Army. In the Brazilian Army, the Military Police is a specialty of Infantry. The operational units of the Army Police, there are several independent battalions and companies. Members of the Brazilian Military Police identified by the use of helmet and black brassards with the letters "PE" in white (or blue-collar and white helmet with red letters). expert report of assessment material. Rear area security and occupation in case of war.